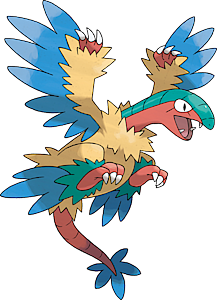 Archeops in game: 411 Who? Important notice! Pokemon Archeops is a fictional character of humans. Archeops (Japanese: ?—??? 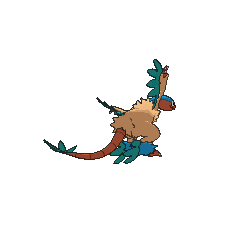 Archeos) is a dual-type Rock/Flying Fossil Pokémon introduced in Generation V.
Archeops is a large, flying creature that bears similarities to a dinosaur. Its featherless, scaly head is red with a green stripe running along the top. Its mouth is filled with sharp teeth. Its eyes are white with black pupils and no irises. 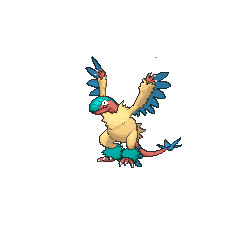 Its body is covered with frayed-looking, yellowish feathers with blue feathers designed for flight on its arms and legs enabling all four of its limbs to act as wings. All of these "wings" bear sharp claws. It has a ring of smaller green feathers on the ankles. 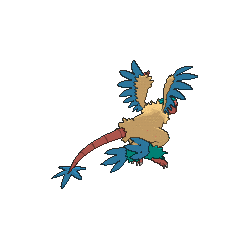 Its tail is completely red and featherless except for a fan of blue feathers at the end, and as with the Archaeopterygiformes, it has fully-movable vertebrae in its tail instead of a pygostyle. 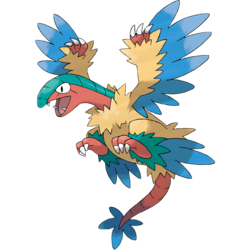 Archeops debuted in Archeops In The Modern World!, when it evolved from a revived female Archen. Multiple Archeops appeared in a flashback in A Restoration Confrontation! Part 1 and A Restoration Confrontation! Part 2. N befriended an Archeops when it was an Archen. It took part in N's battle against Alder. Attacks do even more damage when you make a match of four. 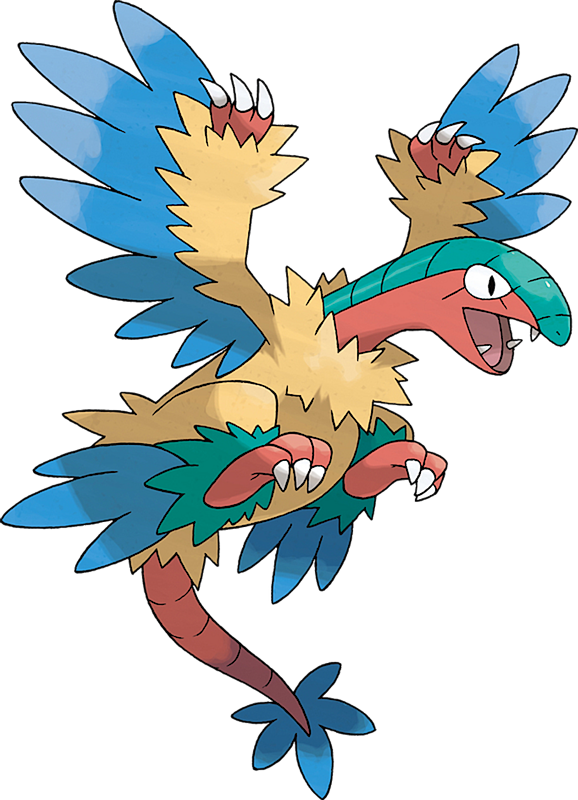 Archeops appears to draw inspiration from the Microraptor, a small, carnivorous dinosaur known for having wings on all four limbs, as well as Archaeopteryx, believed by scientists to be the earliest of all birds, also referenced by its species as the "First Bird" Pokémon. It may also be based on the Feathered Serpents of ancient Mesoamericanmythologies. Archeops and Archeos could be derived from Archaeopteryx. It is possible they may also take inspiration from Cheops (an ancient Egyptian pharaoh).